From left, Dr. Michael Birrer, O’Neal Comprehensive Cancer Center director; Jill Carter, BCRFA board president; Beth Bradner Davis, BCRFA executive director; and Carol Myers, BCRFA board member. Journal photo by Jordan Wald. 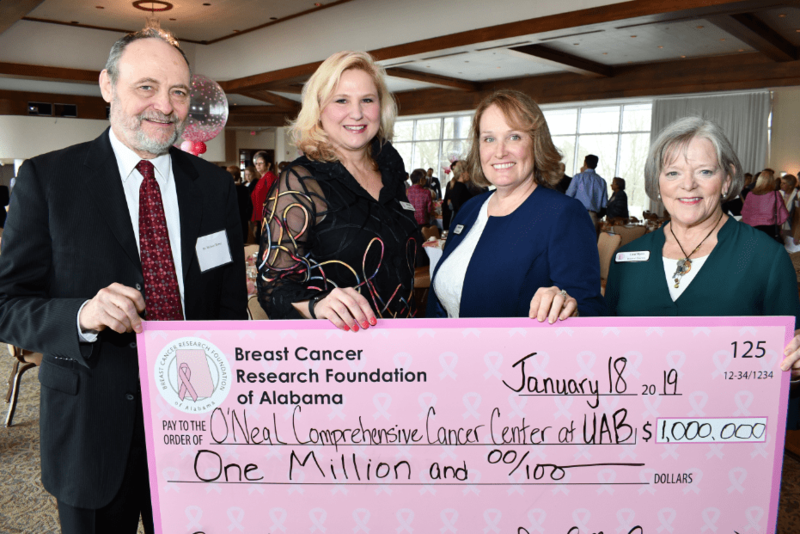 The Breast Cancer Research Foundation of Alabama presented its largest donation to date, amounting in $1 million dollars, to the O’Neal Comprehensive Cancer Center at the University of Alabama at Birmingham on Jan. 18 at a luncheon at The Club. Since its inception in 1996, the BCRFA has made an annual donation to the O’Neal Cancer Center with the proceeds from all its fundraising efforts. The Birmingham-based organization’s cumulative total of donated funds for breast cancer research being conducted at UAB is more than $8.5 million. The funds were raised through sales of specialty breast cancer research license plate, a variety of BCRFA events held throughout the year and from individual and community donations. According to a release, approximately one half of the total donation was raised through the BCRFA specialty car tag sales and now more than 12,500 vehicles in Alabama are equipped with a Breast Cancer Research tag.